I recently acquired a scanner to turn slides into digital files, and I’ve been having fun sorting through slides of my previous garden. 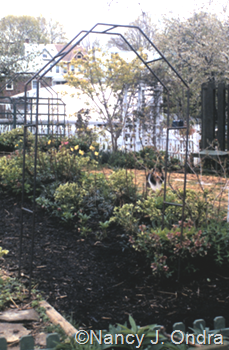 The scanning results haven’t been great, but since I found some images of the arbors and vines I had there, I figured this month’s Garden Bloggers’ Design Workshop would be a good opportunity to try them out. My old garden was tiny compared to my current place, which was a problem in many aspects, but it did have one advantage: It allowed me to put a lot of time into working on details. 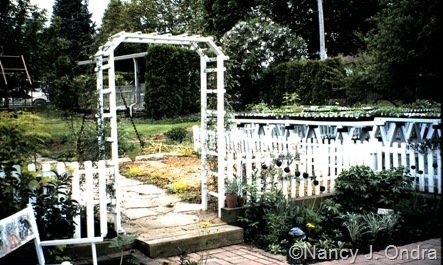 One of my favorite features was the arbor Mom built to separate the patio from the rest of the garden. To accent it, I planted Rosa soulieana, a sweet thing with small, grayish leaves and single white flowers. At least, I thought it was sweet for a few years. However, it turned out to be way too vigorous for this relatively small arbor, and it took way too much pruning to keep the seriously thorny canes from becoming a hazard. I was very sorry to have to dig it out (well, ok, not really very sorry). Lesson learned: Think very carefully before putting any thorny rose on an arbor in a high-traffic area. Other lesson: Do lots of research before finalizing your rose selection, paying close attention to the maximum size reported. Assume it will get half again as big as the largest report, and plan your arbor accordingly. One year, I got into building arbors from copper tubing. I sure wish I’d brought them with me when I moved; with the price of copper now, making more of them isn’t practical. 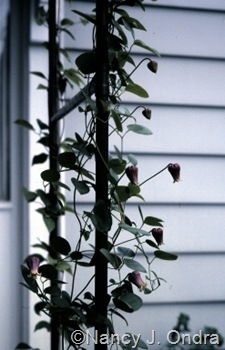 The narrow tubing was ideal for supporting a wide variety of twining vines, as well as tendril climbers such as clematis. 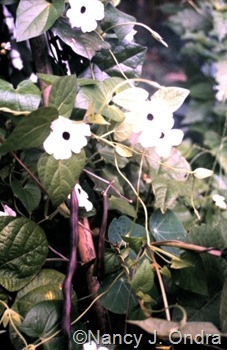 At left above is a picture of one of the arbors; at right above, leather flower or vase vine (Clematis viorna). With several arbors to fill, I had a great time experimenting with lots of annual and tender vines. 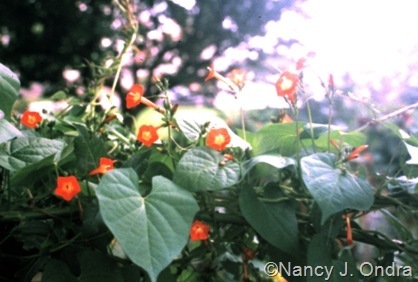 Below, Ipomoea coccinea. 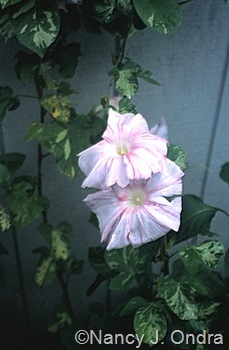 At left below, ‘Tie Dye’ morning glory (Ipomoea) in pink; at right below, ‘Tie Dye’ in blue, paired with ‘Citronella’ Spanish flag (Mina lobata). 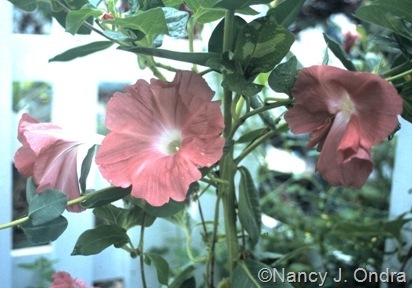 Below, ‘Chocolate’ morning glory (Ipomoea nil). 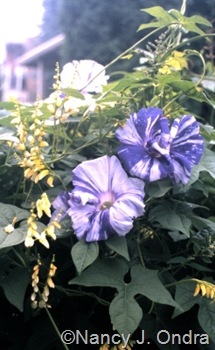 Below left, chickabiddy or climbing snapdragon (Asarina scandens); below right, white black-eyed Susan vine (Thunbergia alata ‘Albo-marginata’) paired with ‘Purple Peacock’ pole bean. 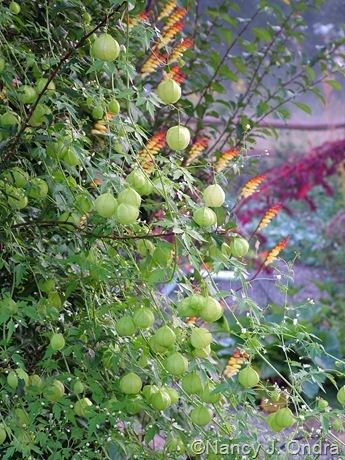 Last, one of my most favorite annual vines: love-in-a-puff (Cardiospermum halicacabum). 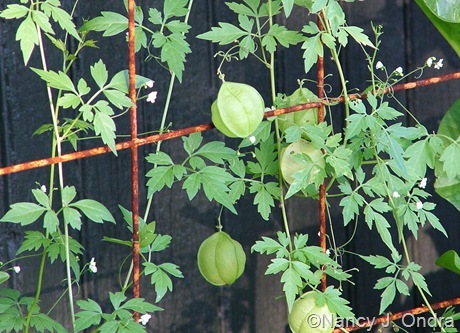 Its lacy leaves and tiny white flowers are cute, but its best feature is the abundance of puffy green pods. 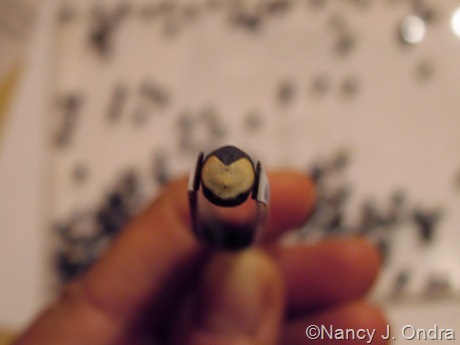 Once the balloon-like pods turn brown, you can open them to enjoy the second-best feature: round black seeds that are each marked with a bright white heart. 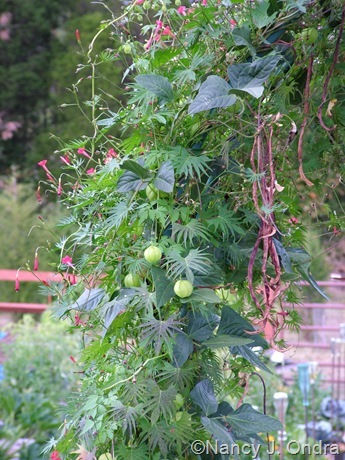 The vines are lightweight enough to scramble up taller companions, creating the potential for some great combinations. To finish, I’ve added some shots from this garden. 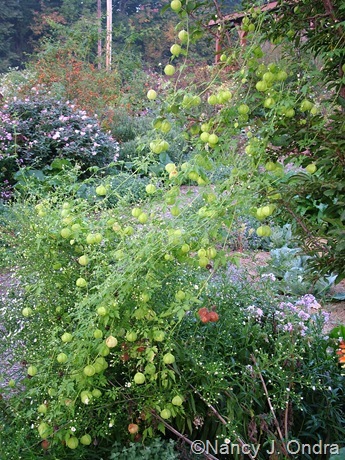 Above, love-in-a-puff vines that scrambled up a woody-stemmed aster and then launched themselves into a nearby plum espalier. 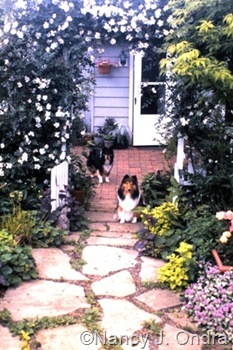 Below left, love-in-a-puff with ‘Red Noodle’ beans and cardinal climber (Ipomoea x multifida). 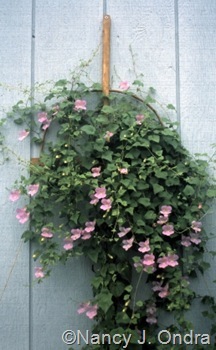 And below right, love-in-a-puff with Spanish flag (Mina lobata). Your arbors are lovely. I have been longing for several years now for an arbor made out of branches and twigs lashed together. I’ve never done that kind of work before, but I know just where it should go in my garden. Maybe I could give it a try this summer. I think I need to find a big patch of willows to work with. Then I will have to figure out how to anchor it so our big winds won’t carry my hard work away. Oh, I know just the kind of arbor you mean, Elizabeth. I love those too! Over at Gardening Gone Wild, our theme this month is arbors and pergolas, and on January 31, I’ll be putting up a summary there of all the related posts for the Garden Bloggers’ Design Workshop. If you’re interested, check it out: There are quite a few rustic arches among them. Your vines are an inspiration. I need to be planting more varieties of vines I can see that right now. Great to see you here, Lisa! You certainly have the space for vines, and you have time left to plan for more. I never knew you had your own blog. It’s great and I love that snapdragon. Hey, I’m glad you found your way here. I didn’t want to monopolize the space over at Gardening Gone Wild. You know how it is, once you start blogging…. I just bought a Lophospermum erubescens, Wine Red. I’ve seen it called Creeping Gloxinia. Is it the same or related to the Asarinas? Hi Theresa – yes, it’s also known as Asarina erubescens (and Maurandya erubescens).